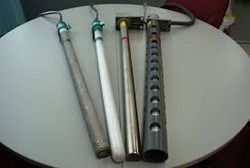 Prominent & Leading Exporter from Chennai, we offer chemical heaters. We are the most trusted name, engaged in offering a quality approved Chemical Heaterthat is widely used in heating highly corrosive chemicals like cocktails, acids like nitric and chromic acids. In compliance with the latest industry standards, the offered heater is manufactured under the supervision of our highly skilled engineers. In order to meet the each and individual requirements of our client, we offer our exclusive heater in customized options as per their given specifications. Looking for Chemical heater ?